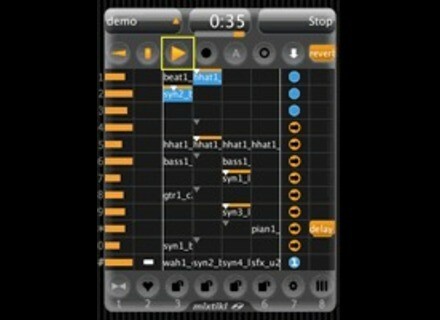 Mixtikl v2, Other software for iPhone / iPod Touch / iPad from Intermorphic. Intermorphic has updated Mixtikl to version 2.4.0.4 for Windows, Mac OS X and iOS. The iOS version is now available in the iTunes AppStore. 3 new add-on Tiklpaks: GenMix 6, GenMix 7, DroneMaker 1. Content Cell now lets you set Generative Bars / Range for generative content cells. Content Cell now lets you set the number of cell repeats / range for each content cell. AirPlay support allows Mixtikl to play through Apple TV or AirPlay speakers (iOS 4.2 required). Further improved New Mix screen with separate "settings" screen. New Mix screen now allows you to select the paks from which to create a new random mix. New Mix > Empty now uses the Volume Max settings from the New Mix > Settings screen. Default max value track volume now set to 86 (used to be 100). Improved Content Cell clarity with different Loop indicator and smaller font text. Added version number display on start-up (all versions). Fixed: Mic recording content now defaults to zero bars (used to be 4 bars countdown...). Fixed: text could be poorly laid-out on the message box display and icon did not always appear. Fixed: display of looping overlay. Zynewave Podium v2.40 Zynewave has updated Podium to version 2.40 and Podium Free to version 2.37, offering minor UI improvements and bug fixes related to bounce rendering. 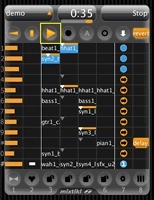 Liine Cliip module for Griid Liine announced a new Cliip module for Griid – the iPad controller for Ableton Live adds hands-on editing and control of MIDI clips. mzuther K-Meter mzuther has released K-Meter, a free, Open Source, implementation of a K-System meter according to Bob Katz's specifications.